All you SCROTUS Scrotums® can skip this post. It contains elements of science. It contains actual facts, not alternative ones. It's not a faked moon landing. It's not fake news. In short: it's nothing in which you'd be interested, let alone understand. At the end of April, Cassini made it's last hurrah in its almost 20 year space flight. Seven years to get there, a decade of data gathering. Think about that for a second. The idea to make this happen: to design it, to plan and launch it. That something travels for seven years and just want it to work for a while yet it goes for almost two decades. The most spectacular thing was that near the end of its life, engineers have been guiding Cassini between the actual rings of the planet. Come September of this year, "they" will crash it into the Saturn's surface. And yes, I know, "we've" done this to other planets. This one just seems weird. Go figure. 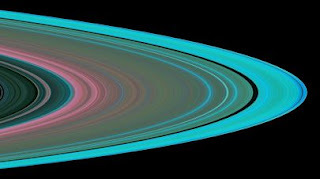 However, I do love all the data on the make-up of Saturn, its rings and its moons. .....if nothing else, it will keep the Dumpsters® counter-acting actual science stuff and maybe ignore ruining our own planet.